After Image was John Grant's second book and is possibly my favourite of the four he has written. On saying that, each one is absolutely worth reading and keeping. Written in 2001, John really was ahead of his time with this book. 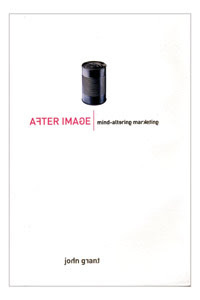 He writes about the demise of image-advertising as a method to build brands. This is not light reading but is very rewarding. I know my friends and colleagues are sick of hearing me talk about this guy but I honestly believe John Grant is the most intelligent marketeer around. If you haven't read his books yet, do. I thought I was the only one who liked "After Image". The book will never be very popular. It attacks its readership, brand managers and ad agency folk who make their living deluding themselves and their customers with this nebulous thing called branding..